This week I started working on the foundation for entity management in the Vortex Editor. “Entities” are a new concept I’m introducing in the next version of the Vortex Engine (V3), whose design responds to the larger effort of simplifying the engine’s API. The Updated UI of the Editor. Entities in Vortex are high level objects that have a transformation, a material, a mesh and (of course) a name. Down the line, the plan is that entities expose more properties. Custom shading and executable code are strong candidates that come to mind. As part of the Vortex Editor vertical slice, however, basic properties for placing entities in 3D space and drawing them are all we need. Entities are also first-class citizens in the Editor, so I reworked the Editor’s UI to add two new panels: an entity list view and a property editor. 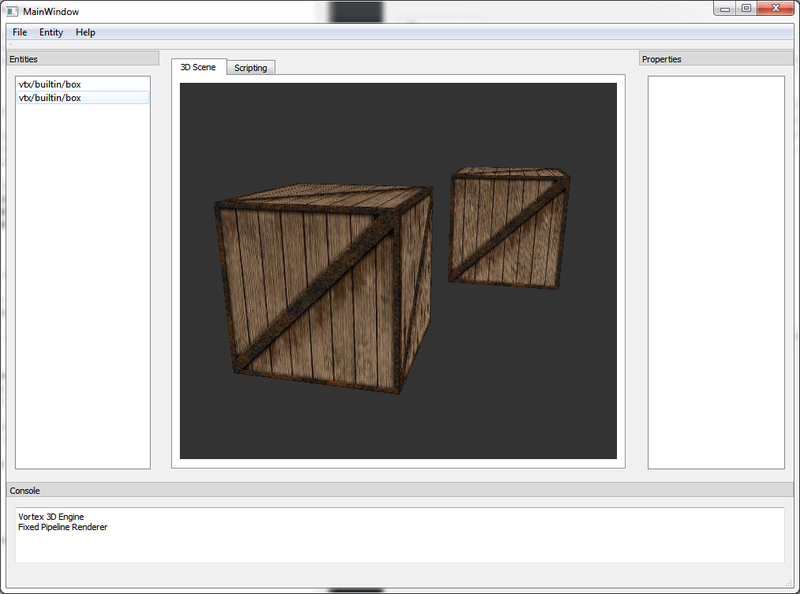 The image below shows a scene setup with two box entities. Note their names listed in the panel on the left. Entity management in the Vortex Editor. Because I wanted the contents of the entity list to be taken directly from the entity management component in the engine, I had to refactor the internal architecture of the Editor a bit. As it was standing before, the OpenGL View was the one handling the Editor Controller and -by extension- the engine. This created a weird situation where the entity list view’s controller would have to go through the GL View to query the existing entities. This had to be fixed. Thankfully, because the Editor Controller was fully encapsulating the engine, it was easy to move the instance of this class upwards in the object hierarchy without introducing undesired dependencies to Vortex’s core in UI classes. All in all, the whole rework didn’t take as big of an effort as I had originally anticipated, and I’m pretty satisfied with the results. The next step now is to expose entity instancing to the Editor UI! Stay tuned for more! Last week I used the (very little) free time that I had to work on the internal architecture of the Editor and how it’s going to interact with the Vortex Engine. In general terms, the plan is to have all UI interactions be well-defined and go to a Front Controller object that’s going to be responsible for driving the engine. This Front Controller, by definition, will be a one-stop shop for the entire implementation behind the UI and it will also, at a later stage, provide higher-granularity control of the engine. 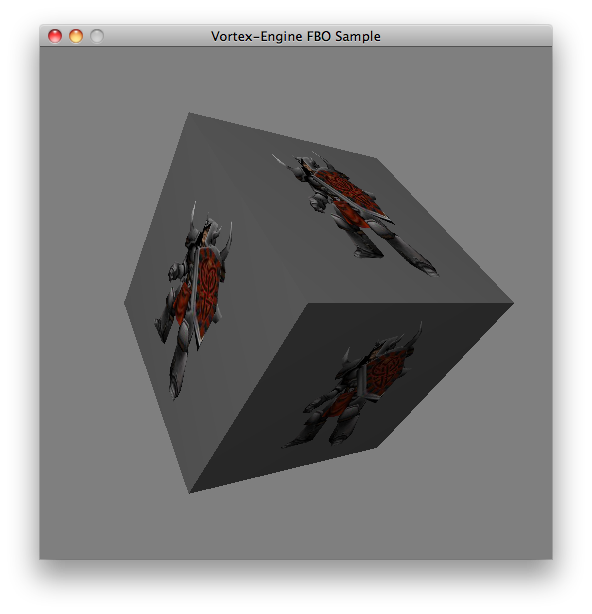 Vortex Framebuffer Object Support: a knight is rendered on a texture that is then mapped on a cube. All rendering is done on the GPU, avoiding expensive copies to RAM. Other components I’ve been designing include an undo/redo stack (which is super important for an editor application) and a scripting API. It’s still early for both these components, but I think it’s better if the design supports these from early on as opposed to trying to tack them on to the Editor at a later stage. 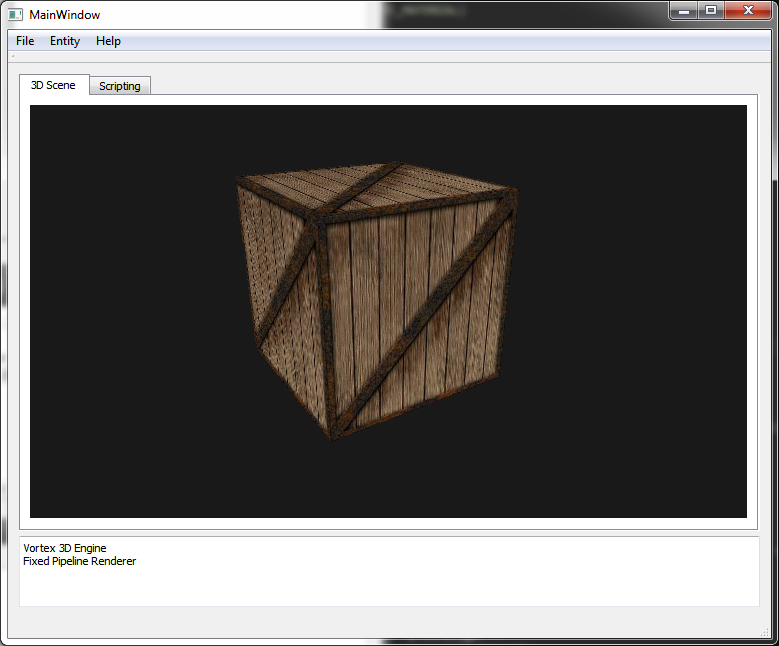 Finally, last week I took the time to bootstrap a higher OpenGL version on Windows. 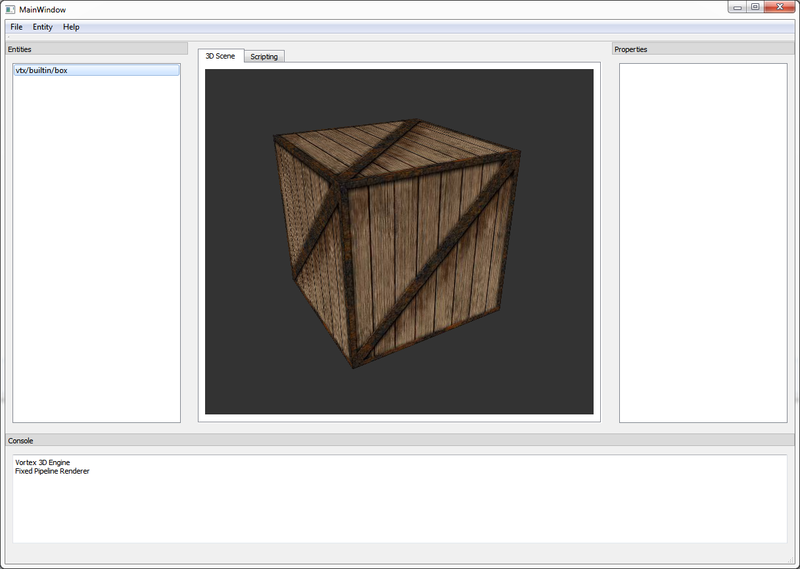 The Editor now has access to full OpenGL on this platform. This is a significant milestone that opens the door for bringing in to Windows Vortex’s advanced rendering techniques, such as FBO objects as depicted in the image above. Not too long ago, I started working on an Editor for the Vortex Engine. I have been toying with the idea for years and I finally decided to get started. Not only because it is going to be an interesting challenge, but also because I feel it’s a good way to improve the development workflow when using the engine. Let’s take a look at the way I can build an App today with the Vortex Engine. First, I would create a new Application (be it a Linux, Mac or iOS App). Then, I would link against the engine, and then finally, I would create a scene through the Vortex API manually. Now, while this approach certainly works and even plays as one of Vortex’s strengths by allowing you to integrate the engine into any App without taking over the application loop, it does become cumbersome to create the scene programatically. Start by taking a first stab in the dark. Realize that you want to change the scene layout. Go back to the code, change it. Rebuild and re-run the App. Repeat from step 3 until you’re satisfied with the results. The idea of the Editor is to tackle this problem head-on. With the Editor, you will be able “see” the scene you are building, tweak it visually and then save it as a package that can be loaded by the engine. Starting a new project for the Editor begs the question of which platforms this App shall run on. The Editor will be a desktop App, so ideally, it would work on all three major desktop platforms: Windows, Linux and Mac. Now, there is no point in making a new renderer for the Editor, as we want the scene we see in it to be as close as possible to what the final user Apps will render. What this means is that the Editor needs to run the engine. Portability has always been one of the key tenets of the Vortex Engine, so this is the perfect opportunity to bring the engine to Windows, a platform it’s never run on before. Bringing to Windows a codebase that was born on Linux and then expanded to support Mac and iOS is the ultimate test for source-code level portability. Once finished, the end result will be a flexible codebase that is also more adherent to the standard. So far, the two main challenges in building the engine on Windows have been: adapting the codebase for building under the MSVC compiler and Windows’ barebones support for OpenGL. Although Vortex is standard C++ and it builds with both GCC and Clang, building it with MSVC required a few changes here and there to conform better to its front end. This also meant reconsidering some dependencies of the engine to allow for a non-POSIX environment. Thankfully, the move to C++11 has already helped replace some UNIX-specific functions with now-standard equivalents. Regarding OpenGL support, the windowing toolkit I’ve chosen to implement the UI in has proven to be more of a problem than a solution. At the time of writing, and mostly because I’m trying to hit a high velocity building the Editor, I haven’t taken the time to bootstrap anything beyond OpenGL 1.1 support. This would be a problem, however, Vortex’s Dual Pipeline support, as I first described in this post back from 2011, has proven essential by allowing the engine to scale down to OpenGL 1.1. The plan is to move forward with the basic Editor functionality and then drop in the programmable pipeline renderer later in the game, retiring the fixed one. It’s quite amazing to see the fixed pipeline renderer, written about 6 years ago, running unmodified on a completely new platform that it has never been tested on before. This is the true virtue of OpenGL. So far work is progressing nicely. As the image above shows, I have a simple proof-of-concept of the engine running inside the Editor skeleton under Windows. This is the foundation on which I will continue building the Editor App. It seems the sun has set on the good old Hypr3D app. 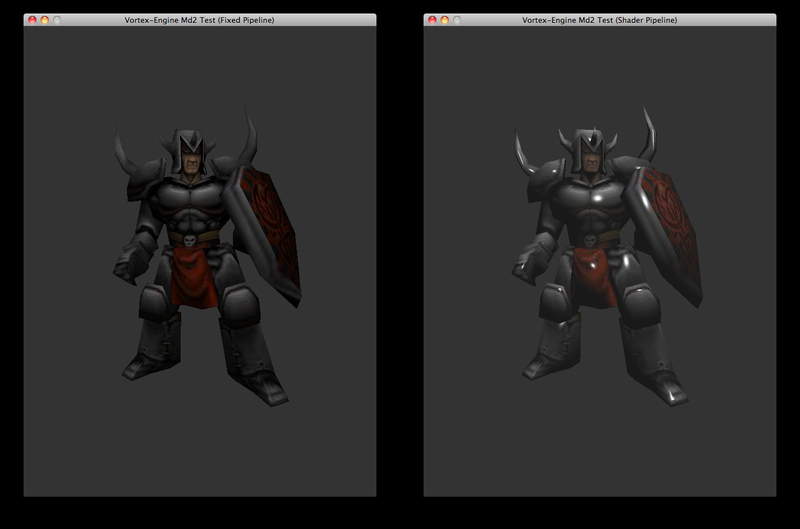 This was the first commercial app to use a licensed copy of my 3D Engine back in 2011. Hypr3D’s help page showing the viewer’s recognized gestures. 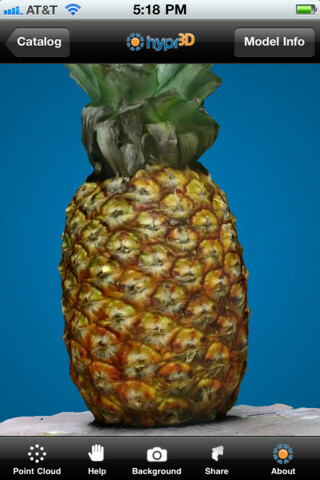 Hypr3D rendering a reconstructed pineapple model on an iPhone. Back in the day, the Vortex Engine was on its 1.0 version and it was pretty much done when the App was developed. Although this made using it almost a “plug and play” experience, there were some interesting problems that had to be resolved during the App development process. On problem in particular was how to integrate a HTML UI with the Objective-C Front Controller of the App. This was way before any of the modern “hybrid app” toolchains existed and I remember I was on a trip to Seattle when I started to lay down the main concepts. Goodbye Hypr3D, I’ll always remember the countless hours staring at the cookies reference model while debugging! I’ve created a dedicated page in the memory of Hypr3D with a short feature list and some more screenshots. 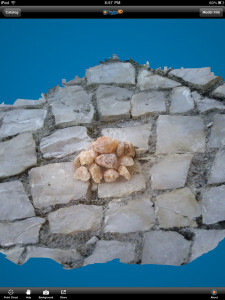 You can visit it here.